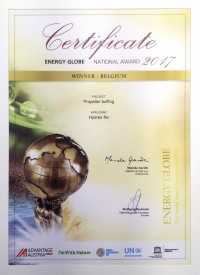 On 27 November 2017 a delegate from the Austrian Chamber of Commerce at the Austrian embassy in Brussels, Mrs. Martina Madeo, visited Hydrex nv in Antwerp to present the company with the National Energy Globe Award for 2017. Hydrex won the award for Belgium for its Propeller Buffing project. Hydrex CEO Boud Van Rompay accepted the award on behalf of the company. "It is our duty and responsibility to assure that our young people will have an intact environment tomorrow." With these words Wolfgang Neumann launched the ENERGY GLOBE World Award for Sustainability in 1999, today’s most prominent and prestigious environmental prize. From all over the world, projects are showcased that conserve and protect our resources or that employ renewable energy. The goal is to present successful sustainable projects to a broad audience, for many of our environmental problems already have good, feasible solutions. More than 2.000 projects and initiatives from a total of 178 countries were submitted for this year’s award. The traditional approach in the propeller maintenance industry is to polish it with a grinding disk which can be quite damaging to the propeller. By the very fact of using a grinding disk, a substantial amount of metal is removed from the propeller itself. This can alter the shape and efficiency, cause roughness and increase rather than reduce friction. This roughness has several ecological and economical aspects. A rough propeller can consume up to 10% of additional fuel. This is an economical problem, but also an ecological one because of the increased greenhouse gas emission. Then there is the aspect of the polluting particles dropping into the sediment, making it a source of marine pollution which is a problem in a number of ports. Hydrex discovered that more frequent, lighter cleaning of the propeller using a different tool to a grinding disk, and catching the propeller before a calcareous layer builds up is actually the optimum approach to propeller cleaning. If done right and done regularly it can result in 5% or even more fuel savings. No material is ground away, which is good for the propeller and the environment. Until that breakthrough, there were no smooth propellers. For a ship that has a medium level of fuel consumption, the savings far outweigh the cost of the propeller cleaning itself. Because the propeller is being cleaned regularly any loss of material and hence increased roughness is prevented entirely. Propeller buffing is by far the most environmentally safe propeller cleaning technique available today and this made the jury decide to give the Energy Globe Award for 2017 to Hydrex for this project.